The original Ghostbusters came out in the same year I was born, and growing up it was something of a rite-of-passage to watch it for the first time. The kids in my class were divided into those who knew what people were talking about when they mentioned the ghost in the library, and those who didn’t. In hindsight, Ghostbusters isn’t a particularly appropriate film for children – along with some very adult jokes there are some truly terrifying scenes as well (those hellhounds still creep me out). Perhaps it was the spin-off cartoon that gave everyone in my class the impression it was for kids, as the movie’s blend of dark comedy and genuine scares is probably what makes it such a cult classic. Well, that and Bill Murray’s performance. And Ray Parker Junior’s theme song. And its quirky premise. And the loving depiction of New York in all its grit and glamour. Yeah, there are many reasons why Ghostbusters is considered a classic, and though I can’t get behind the mentality that the recently released rebooting is going to ruin anyone’s childhood, I can understand why people are protective of the original. 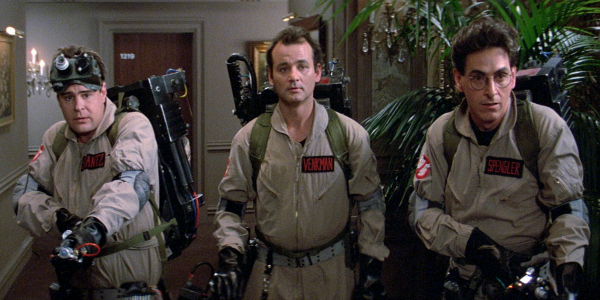 Peter Venkman (Bill Murray), Ray Stantz (Dan Aykroyd) and Egon Spengler (Harold Ramis) are disgraced scientists kicked out of Colombia University and forced to go into business for themselves. 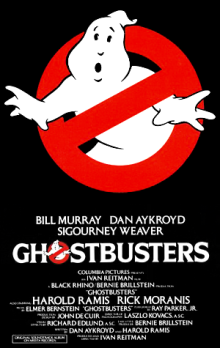 Venkman’s great idea is to sell themselves as paranormal exterminators – or ghostbusters – who rid homes and businesses of unwelcome spooks. They’re an unexpected hit among the citizens of New York, particularly Dana Barrett (Sigourney Weaver) who goes to them for help after experiencing strange phenomena in her apartment. The Ghostbusters – joined by Winston Zeddemore (Ernie Hudson) to help cope with demand – realize that the sudden influx in ghosts throughout the city portends something. But having become the target of an irate bureaucrat convinced that they’re phonies, the results of the Ghostbusters’ research into Dana’s case might not reach fruition before the city is destroyed. Well, I’m going on a hiatus for a while – not because I’m tired of writing Big Worlds on Small Screens, but because I’ve simply run out of material to write on! I’ll be spending the next few months catching up on speculative television shows I haven’t seen yet so that I can write up lots of new articles when I return. See you then! Rebecca Fisher is a graduate of the University of Canterbury with a Masters degree in English Literature, mainly, she claims, because she was able to get away with writing her thesis on C.S. Lewis and Philip Pullman. She is a reviewer for FantasyLiterature.com, a large website that specializes in fantasy and science-fiction novels, as well as posting reviews to Amazon.com and her They’re All Fictional blog. Rebecca won the 2015 Sir Julius Vogel Award for Best Fan Writer, for writing that included Big Worlds On Small Screens. And as well as today’s Big Worlds on Small Screens goodness, tomorrow we have a guest post from Kim Falconer, together with a giveaway of her new-out urban fantasy, The Blood In The Beginning. I’m looking forward to it.